A legend among barbecue purists, Lang has been manufacturing traditional offset smokers for nearly three decades. These heavy metal stick burners are built to last virtually forever and produce fantastic smoked food, making them a favorite on the competition circuit. 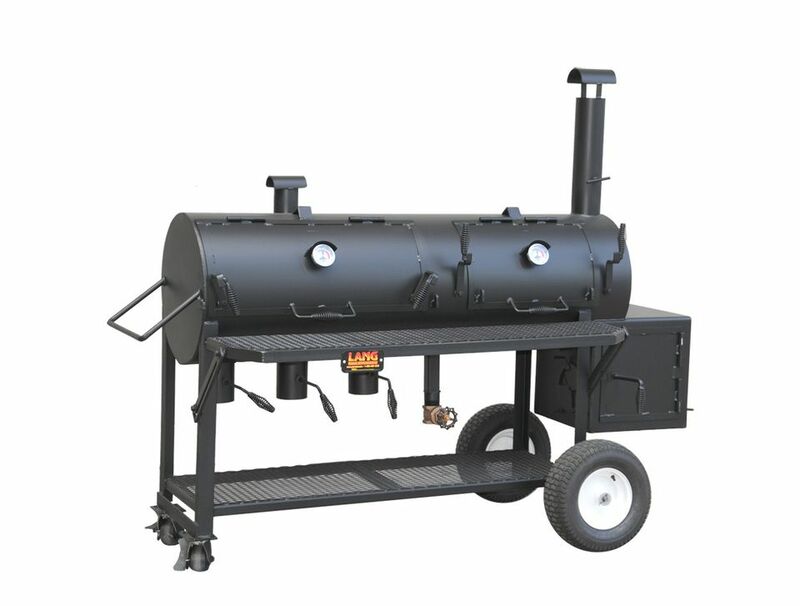 The Hybrid is a combination smoker and charcoal grill built in the same 1/4-inch steel pipe and separated so they can be used individually or at the same time. This makes this patio model a very versatile cooker. There are a number of options for the 36" model, including a trailer configuration so you can take it where you need it. Lang builds serious smokers for people who are serious about barbecue. You see these smokers at the top barbecue competitions, on TV shows, and in the backyards of some of the biggest names in barbecue. This smoker is made from 36-inch diameter 1/4-inch steel pipe. This particular model weighs near a thousand pounds and can be purchased mounted on a full sized trailer. This is a high-quality product. Since 1988 Ben Lang and his company have been making these traditional smokers. Built on the standard horizontal offset smoker, Lang incorporates the reverse flow air pattern to even the heat that can be a problem with this type of smoker. Basically speaking heat and smoke flow from the large firebox on one end of the smoker, under a metal plate in the bottom of the cooking chamber to the other size, then it is released to where the food is and back across to the smokestack mounted next to the firebox. This creates a circular air and smoke flow pattern. The heat under the bottom plate heats the cooking chamber. In a standard offset smoker, the temperature difference between the area near the firebox and the opposite end can be dramatic. With reverse flow, that difference is greatly reduced but it is still a good idea to shift foods around to even out the cooking. The Patio Hybrid is a smoker and a charcoal grill built in the same steel pipe divided by a welded plate in between. While they appear relatively small, this is actually a pretty good sized unit with a total cooking area near 2,000 square inches, divided between the two functions. What this provides is a cooker that can smoke a couple of briskets, a few racks of ribs, and enough burgers for a couple of football teams. While the charcoal grill side can be easily fueled with a bag of charcoal from the grocery store, the smoker works best with split logs (hence the reference to being a stick burner). This needs to be hardwood and not just firewood picked up at the store. As a smoker it is good, producing a good amount of smoke, but to stay hot it needs fuel and this means regularly adding wood to the fire. This is not the kind of smoker that will let you sleep through the night if you need to have slow smoked brisket ready the next afternoon. This is a smoker for the person who is willing and able to tend the fire.